Needs full description of each cell. Castle Skingrad is a castle located just outside Skingrad. 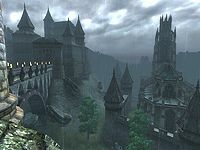 It is the seat of the Count of Skingrad, Count Janus Hassildor and the power center of County Skingrad. The castle is situated outside the city; a characteristic shared only with Anvil Castle. It is found on a steep hill overlooking Skingrad and is connected to the road via a lit bridge. The Main Hall of Castle Skingrad does not serve as a throne room, as is the way in all of the other Cyrodiil Castles. Instead, Count Janus Hassildor has stewards that make appointments for him. There is a secret passage way from the dungeons to the wine cellar. There is a secret room in the wine cellar. This room contains bottles of Human Blood. You can get there by pulling the "Strange Candle" to the right of the middle wine keg, which acts as a lever and opens the middle keg. Esta página foi modificada pela última vez à(s) 22h38min de 11 de julho de 2013.